A centre of ancient origins with a rich variety of tourists attractions and a particularly mild and pleasant climate which enhances the variety of springwater related activities. the old town, which dates back to the Neolithic age, is dominated by the Castle. Every year on August 15th the "Giostra del Saracino" is contested, a challenge on horseback between the five contrade or districts of the town and in which participants, using a lance, must catch a ring worn by a Saracen - the eternal enemy. The contest is preceded by the drawing of lots. Traditional dress is a feature of the event. 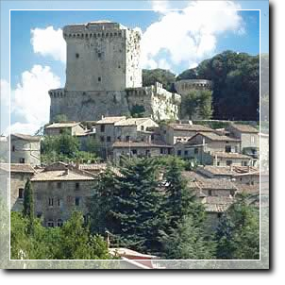 Also worth a visit is Castiglioncello del Trinoro, a typical medieval village with a wonderful view of the valley below. Close to Sarteano, on the hill of Pietraporciana, a protected beech-wood has proved to be of special interest to the Italian botanical society. It is pleasant to eat out here in the picnic area provided. 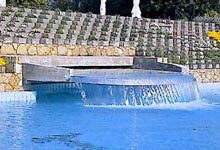 The Pool is located in a well-shaded location surrounded by green hills caressed by pure, health-giving breezes.Its three pools and giant whirlpool are fed by the mineral-rich waters of the Santa Lucia spring. They flow at a rate of 250 liters per second and a temperature of 24° C, soothing the visitor's eyes and toning the bather's body.